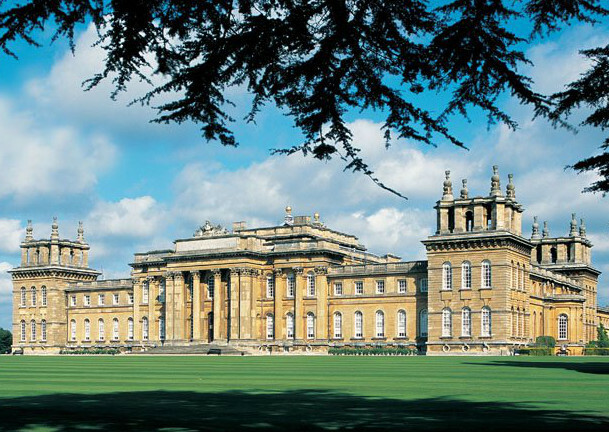 Sprawling amid its 2,100-acre estate, Blenheim Palace is one of England’s largest houses and the seat of the Dukes of Marlborough. Built between 1705 and 1724 and designed in the rare and short-lived English Baroque style, it was a gift from Queen Anne to John Churchill, 1st Duke of Marlborough, following his famous victory over the French and Bavarians at the Battle of Blenheim in 1704. It was to become the ancestral home of the Churchills for the next 300 years and the birthplace of the most famous Churchill of them all, the English Prime Minister Sir Winston. The ‘Capability’ Brown-designed landscaped parkland helped the palace gain its World Heritage status and is an attraction in its own right, with its lake and formal gardens, including the beautiful Water Terraces, Arboretum, Italian Garden, Secret Garden and Rose Garden. The Palace interiors are as vast and as intricately detailed as the grounds. Collections of portraits, tapestries and an exquisite collection of Boulle furniture grace the rooms. In the China Ante Room are displays of Meissen and Sevres porcelain while the magnificent Nicholas Hawksmoor ceilings and the stonework of Grinling Gibbons throughout the Palace are equally eye-catching. Architectural appreciation of the palace’s English Baroque style is as divided today as it was in the 1720s, but Blenheim Palace is a unique building in its combined usage as a family home, mausoleum and national monument. There is much to discover about the palace’s fascinating history. A modern exhibit at the site, Blenhein Palace: The Untold Story uses innovative projections, moving figures and touch-screen technology to bring the last 300 years alive through the eyes of the servants. The experience adds a new dimension to the magnificent State Room tour downstairs and introduces visitors to some of the more colourful characters from the past. Another exhibition, Churchill’s Destiny – the Story of Two Great War Leaders, is now open in the stables, highlighting the fascinating parallel lives of one-time resident Sir Winston Churchill and his ancestor the 1st Duke of Marlborough.